Looking for that first time sailing experience? A small craft suitable for inland lakes! Look no further, our 10' Sailing Dinghy is the ideal craft to learn the art of sailing. A beamy little boat with excellent sailing characteristics. Even in strong winds, its ease of handling makes for pleasurable sailing. The 36 sq. ft. of sail area ensures stability and allows the hull to come about. A joy to build and sail. Detailed construction drawings and step by step instructions take you through each phase of the building procedure. 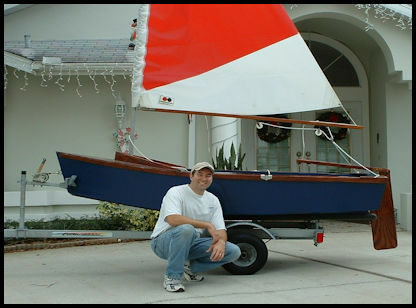 An excellent project for the first time boat builder and sailor. The sail is sold separately - $185.